In her first bid for political office, Niki Tsongas last night captured the Democratic nomination in the Fifth Congressional District race, defeating four opponents who have more experience as elected officials but lack her legendary political name. Tsongas, who won by 5 percentage points over her closest opponent, Lowell City Councilor Eileen Donoghue, will now face Republican Jim Ogonowski, who handily defeated Tom Tierney in the Republican primary. Almost immediately, the candidates shifted to the general election and sought to emphasize national themes in the country's lone open congressional seat. "This is just round one," Tsongas said at a ballroom at the Doubletree Riverfront Hotel in Lowell. "Make no mistake, this election will be a referendum on the presidency of George Bush." Ogonowski, who in an interview last night with WBZ radio said he would decline if President Bush offered to campaign with him, announced he would run as an outsider and would focus on overhauling immigration, cutting government spending, and reducing dependence on foreign oil. "The real work begins now," Ogonowski, a 49-year-old farmer from Dracut running in his first election, said last night in an interview before attending a celebration at an American Legion hall in Dracut. "We have six short weeks, and there's a lot of things to talk about. . . . I didn't get in this race to lose," he said. Campaign aides said Ogonowski plans to go on the attack in a speech in Chelmsford this morning less than an hour before Democrats are planning to hold a unity rally in Lowell to mobilize for the Oct. 16 general election. With all 195 precincts reporting last night, Tsongas had 36 percent of the Democratic vote; Donoghue had 31 percent; Jamie Eldridge, a state representative from Acton, had 14 percent; Barry Finegold, a state representative from Andover, had 13 percent; and James Miceli, a state representative from Wilmington, had 6 percent. On the Republican side, Ogonowski had 89 percent and Tierney had 11 percent. In an election coming on the heels of a holiday weekend, a turnout of about 18 percent appeared to lend itself to the candidate with the most name recognition. 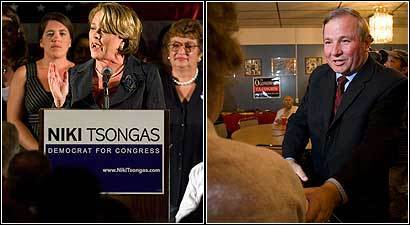 Though her husband, the late US Senator Paul Tsongas, was well known throughout a district that elected him every time his name appeared on a ballot - he served two terms as US Representative from the Fifth - Niki Tsongas herself had never run for office. Donoghue beat Tsongas in several communities - including Chelmsford, Dracut, and Methuen - and most significant, she carried Lowell, the home turf for both candidates, by a 2-to-1 margin. Tsongas did better in the smaller, wealthier towns along Route 2, such as Concord, Wayland, and Sudbury. "This has been a long, hot summer," Donoghue told a cheering crowd of several hundred supporters at Long Meadow Golf Club in Lowell, stressing that the Democrats should now unite behind Tsongas. "We knew this was going to be a tough race, and it really was," she said. In special election campaigns that largely were run in the summer months, candidates struggled for attention, trying to attract voters by hosting movie screenings, giving out ice cream, and inviting residents to a Wiffle ball tournament. For most of election day, things were similarly subdued. At the Lowell Senior Center late in the afternoon, 12 poll workers and one police officer were seated in a room where the only sound was the hum of the refrigerator in the back. There were no voters in about 30 voting booths lining the walls. "It's, um, slow," said Claudine Langlois, the precinct's warden. Of nearly two dozen voters interviewed by the Globe, few cited any overriding issue that drove them to the polls. Several apologized for their limited knowledge about the race, saying they took advice from friends or relied on the signs they pass on their daily commute. "I don't know," said one man who voted for Tsongas in Concord. "I've seen more of her signs than the others." The seat became vacant when US Representative Martin T. Meehan, who had held it for 14 years, announced in March that he was resigning to become chancellor of the University of Massachusetts at Lowell. Tsongas, 61, who is trying to become the first female congressional member from Massachusetts since 1982, has touted her Washington political connections and pledged to get troops out of Iraq by March 2008. Ogonowski, seeking to become the state's first Republican congressional member since 1996, has used his outsider status to rail against Washington and says the troops should remain in Iraq indefinitely. The state Republican Party is planning to mobilize behind him, and several national Republicans have held fund-raisers for Ogonowski, who had a 28-year career as an Air Force lieutenant colonel and whose brother was the captain of one of the planes flown into the World Trade Center on Sept. 11, 2001. Tsongas, who for the past 10 years has been the dean of external affairs at Middlesex Community College, has the support of the Democratic faithful and is well ahead in fund-raising, carrying nearly $500,000 as of Aug. 15, nearly five times more than Ogonowski. The general election race will also include independent candidates Patrick Murphy, 26, a bricklayer from Lowell, Kurt Hayes, a Boxborough businessman, and Constitution Party candidate Kevin Thompson, whose party currently has about 50 members in Massachusetts. Globe correspondent John Guilfoil contributed to this report. Matt Viser can be reached at maviser@globe.com.